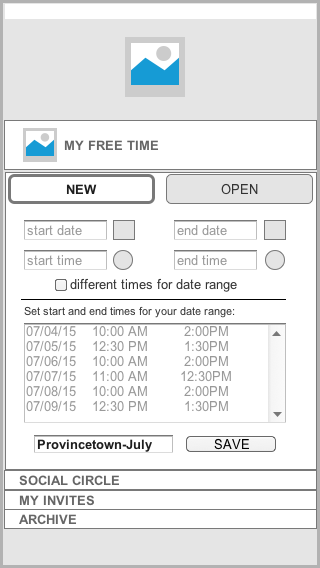 Enabling people to find common available dates and times to book activities together. In July 2015, I graduated from the General Assembly User Experience Design Program. Over the course of the program, I developed an idea for a social mobile app that would allow people to quickly cross-polinate their free time with friends and family and find common days and times to get together for an activity whether it be for an impromptu afternoon cup of coffee or a walk in the park that day or for an activity planned for a later date. If you've ever found yourself out and about, whether running errands or on vacation, only to realize later that a friend or family member just happened to be in the area and you missed an opportunity to connect with them for a quick lunch or coffee, your first thought might have been, "If only I knew they were around, we could have caught up with one another!" or "My day is pretty open today. I wonder who's around to grab lunch?" But wait, can't I already do that with the variety of mobile apps already out there? Well, yes and no. Yes, there are some apps out there that allow you to set up an event and invite your friends to attend it. But no, in many cases, you're limited to the boundaries of the social media platform you and your friends belong to. What about those who don't subscribe to those social media platforms? Yes, you can try online platforms for event planning but then no, your e-vite emails might get zapped by spam filters, overlooked by the recipient, and in many cases, not getting responses in a timely manner in spite of the boldfaced 16pt RSVP deadline date. Further, those online resources are typically geared towards larger planned parties, not smaller, on-the-fly activities. ...you and your friends could publish to each other through direct app-to-app communication, your available free time (whether that be a day, a week, or a month, etc)? And what if that app, upon receiving your friends' available free time, could quickly tell you where you share common dates and times? And even further, what if you could replace time-consuming back and forth text messages with a few taps to lock in a committed RSVP to get together for an activity? Here's the background that inspired my idea. A couple of years ago, I was on a two-week vacation on the Cape. During that time, I occasionally ran into friends I didn't realize were also there or I would learn on Facebook that they had arrived a day or two before.. We tried to make plans and work around other plans already in place. A lot of back and forth with texts, emails, and phone calls didn't result in a lot of dates for cocktails, meals or activities. After my vacation, I realized that other friends had come and gone while I was there and neither party knew it. If we'd known, we could have actually locked down some social time. I realized that this similar situation had happened in past years so I thought... there's GOT to be a better way to manage all this. The sections below outline the UX design methodologies I utilized to determine the user experience. To view the user interface design for ConnexUs, click here. A summarized explanation of the problem space. So What Are the Pain Points? I developed a hypothesis of what I perceived the pain points would be based on my personal experience. This gave me a foundation to start with when it came time to conduct interviews and I needed to formulate the types of questions I would want to use to explore the problem space further. It was important to recognize (for the sake of the interviews) the two distinct types of social activities people plan for. Impromptu activities are all about spur-of-the-moment planning like grabbing coffee or a cocktail, a quick bite to eat in the neighborhood, a walk along the Esplanade, biking, etc. Planned activities are usually more deeply thought out and further out on the calendar like brunches, dinners, day-trips, hiking, hosted parties. While I could have gotten granular with a variety of pain points, I felt it was important to keep this list narrowed to some basic sticking points and allow the interviews to provide me fresh information to build from. Research took the form of interviews conducting face-to-face sessions, FaceTime and Skype video conferencing, and phone conversations in order to learn more about people's behaviors, attitudes, goals, and pain points in order to develop working personas and stories that would inform my approach going forward. It also involved doing a competitive analysis of other social media and planning apps to more clearly understand how well or how poorly activity planning is currently handled. A high level, summarized view of my findings resulted in four distinct persona types, illustrating a cross-section of lifestyles. A deeper persona comparison matrix was developed for an at-a-glance reference. This matrix summarizes and highlights key information but is backed by more detailed notes from the actual interviews. A heat map approach made for a quick visual reference of how well or how poorly some apps handled their calendaring functionality and planning tools. A sketch comparison of selective screens from popular apps helped me understand different approaches to displaying home screens, navigation, and events. In the end, while my perceived pain points were fairly on target, the interviews and information gathered provided the validation I needed. Most importantly, clear information that ASSUMPTION and HABIT are two human experience factors that often get in the way of a fuller more enjoyable social activity planning experience. Lots of sketching and course corrections before committing to digital form! 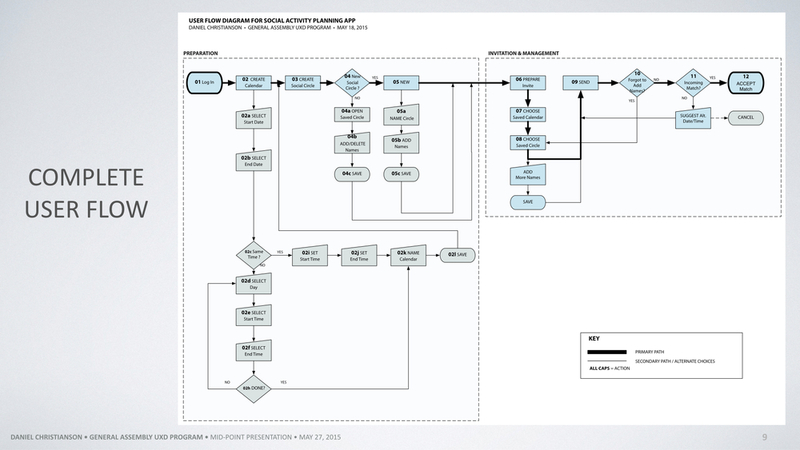 Using OmniGraffle to create a clear illustration of the user flow. Segmenting the flow into the two areas of Preparation and Invitation & Management helped to clearly delineate the two areas of the app experience. This also helped map out the information architecture/site map. Focusing purely on the calendar feature for this app, I developed three simple goals and tasks users would need to take to put an activity together. From this, sketches helped form the basis for what the app screen might look like. Sketches were then taken to the next level by building out wireframes using Axure Pro. Click on the thumbnails below to see a larger version in a lightbox. To view the user interface design for ConnexUs, click here.